More Projects from Taylored Expressions June Release! 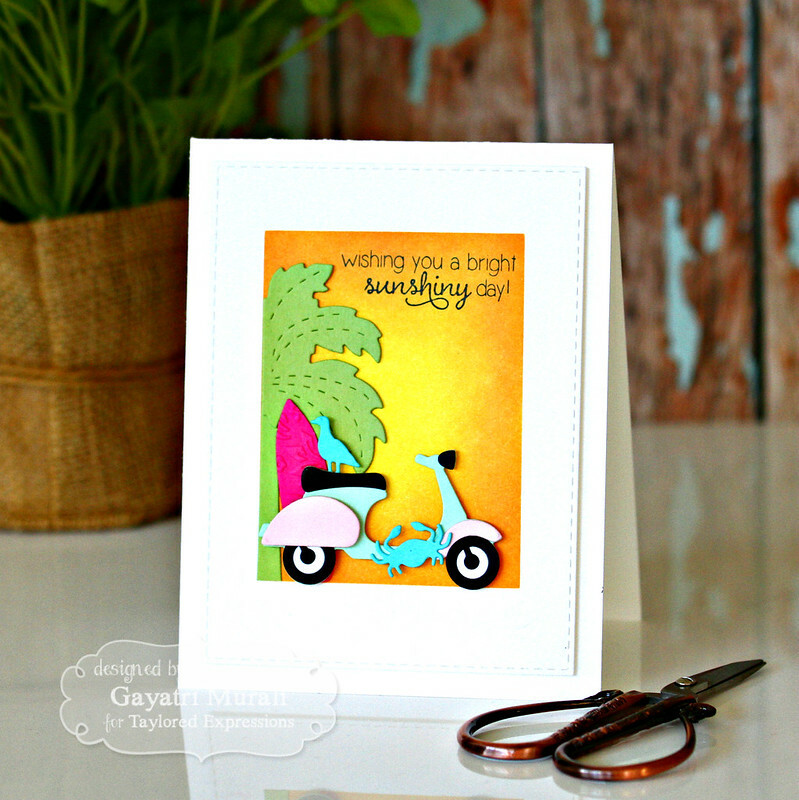 But today I am sharing with you couple of more cards I made using Taylored Expressions June release products. First up is this card I absolutely LOVE. I didn’t plan it to happen this way. I had another idea in mind when I started making this card, but the course changed during the process of making. It turned out better than my original plan. This card uses On the Line Beach Cutting Plate and On the Road Scooter dies to make my card. I diecut a stitched rectangle panel using the largest of the Stitched Rectangle Stacklets die set using Sugar Cube cardstock. I masked the edges using one inch masking tape and sponged Lemon Meringue and Candy Corn dye inks from Taylored Expresssions to give the bright sunset background. I then die cut the On the Line Beach tree and its layer using Granny Smith cardstock. I glued the layering piece over the other, trimmed the other tree and bottom of the die cut as I only needed one tree. I adhered is tree to the left edge of the masked area. I die cut the surf board using Lolipop cardstock, ran through Garden Party embossing folder to get dimension and floral pattern on the surf board. I die cut the crab and bird out of Cookie Monster cardstock. 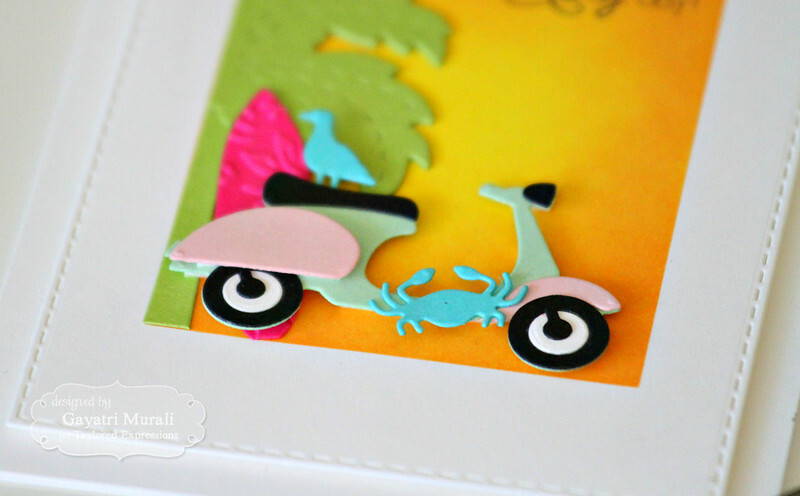 The scooter is die cut using Oreo, Sugar Cube, Mint Julep and Cupcake cardstocks and assembled to get the retro look. I then assembled the die cut by layering them next to the tree. Stamped the sentiment from Sunshiny Day stamp set using Oreo Hybrid ink. Here is a closeup! 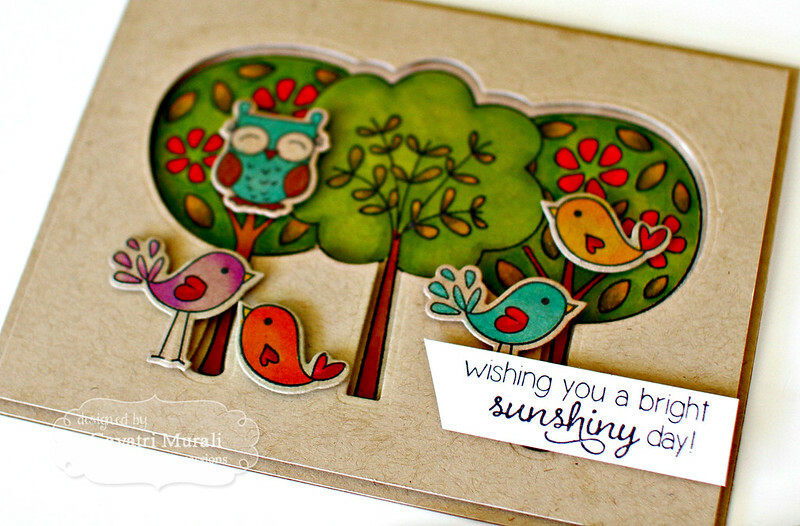 My second card showcases new dies for an older stamp set called Sunshiny Day. I LOVE colour on kraft cardstock. Love the muted look of those bright colour. 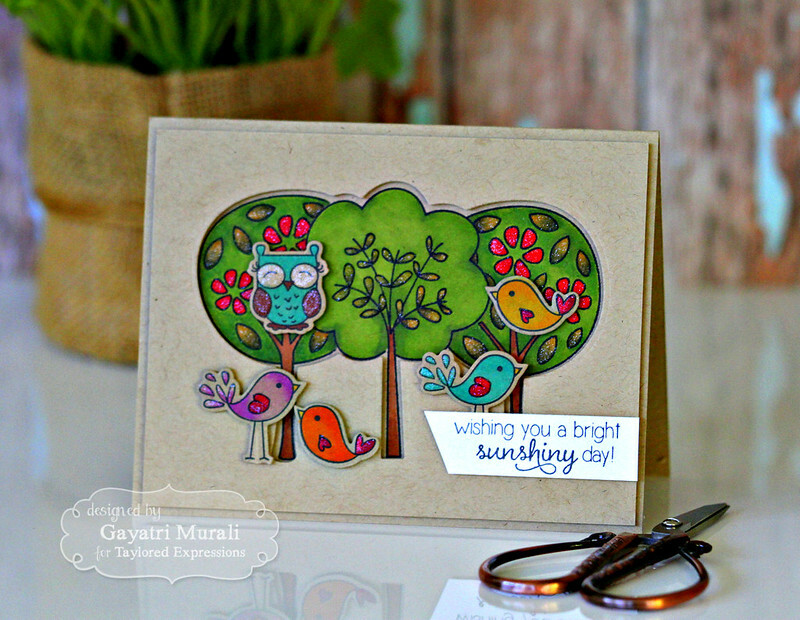 I stamped the birdies from Sunshiny Day stamp set on Toffee cardstock using Oreo Hybrid ink. This ink can be used with copic markers. So I coloured them with copic markers and die cut them out using the new coordinating dies. For the card front, I die cut a Toffee cardstock panel about 1/4 inch smaller than the card base. In the centre of the panel, I die cut the tree dies. I started with the centre tree and then overlapped each side with another tree die. I then adhered the panel on top of the card base temporarily to stamped the images. Again I stamped the centre tree first, then masked the tree to stamp the trees on the sides. I removed the mask and the top panel. Copic coloured the tree images. Adhered the panel back using foam adhesives for dimension. Then all the birdies using the foam adhesives as well. I brushed some shimmer using Wink of Stella clear shimmer pen on certain areas. The sentiment is stamped on a strip of Sugar Cube cardstock. Hope you like my cards. For more inspiration check out Taylored Expressions Gallery. Gorgeous cards and what an amazing sight of the dolphins on your walk. What amazing cards!! The second one the kraft cardstock is absolutely awesome!! Must have been fun to look at those dolphins!